Surviving fragment of the Piri Reis map showing Central and South America shores. In his notes appended to it is written "the map of the western lands drawn by Columbus"
The Piri Reis map is a world map compiled in 1513 from military intelligence by the Ottoman admiral and cartographer Piri Reis (pronounced [piɾi ɾeis]). Approximately one third of the map survives; it shows the western coasts of Europe and North Africa and the coast of Brazil with reasonable accuracy. Various Atlantic islands, including the Azores and Canary Islands, are depicted, as is the mythical island of Antillia and possibly Japan. The historical importance of the map lies in its demonstration of the extent of European exploration of the New World by approximately 1510, and in its claim to have used Columbus's maps, otherwise lost, as a source. It used ten Arab sources, four Indian maps sourced from the Portuguese, and one map of Columbus. More recently, it has been the focus of pseudohistoric claims for the pre-modern exploration of the Antarctic coast. From eight Jaferyas of that kind and one Arabic map of Hind [India], and from four newly drawn Portuguese maps which show the countries of Sind [now in modern day Pakistan], Hind and Çin [China] geometrically drawn, and also from a map drawn by Qulūnbū [Columbus] in the western region, I have extracted it. By reducing all these maps to one scale this final form was arrived at, so that this map of these lands is regarded by seamen as accurate and as reliable as the accuracy and reliability of the Seven Seas on the aforesaid maps." There is some scholarly debate over whether the 20 charts and mappae mundi in Piri's inscriptions includes the eight Ptolemaic maps, the four Portuguese maps, the Arabic map and the Columbus map. From one perspective, the number of charts and mappae mundi used by Piri equals 20, while in the other, it could mean a total of 34. Some have claimed that the source maps were found in the ancient Library of Alexandria, based on Piri's allusions to Alexander the Great, the founder of Alexandria, Ptolemy I, who ruled Alexandria in the 4th century BC, and Claudius Ptolemy, the Greek geographer and cartographer who lived in Alexandria during the 2nd century AD. Gregory McIntosh states "Arab writers often confused Claudius Ptolemy, the geographer of the second century C.E., with Ptolemy I, one of Alexander's generals... Piri Reis has undoubtedly made the same error, resulting in his believing the charts and maps were from the time of Ptolemy I instead of Claudius Ptolemy." The map was discovered serendipitously on 9 October 1929, through the philological work of the German theologian Gustav Adolf Deissmann (1866–1937). He had been commissioned by the Turkish Ministry of Education to catalogue the Topkapı Palace library's non-Islamic items. At Deissmann's request to search the palace for old maps and charts, the director Halil Edhem (1861–1938) managed to find some disregarded bundles of material, which he handed over to Deissmann. Realizing that the map might be a unique find, Deissmann showed it to the orientalist Paul Kahle, who identified it as a map drawn by Piri Reis. The discovery caused an international sensation, as it represented the only then known copy of a world map of Christopher Columbus (1451–1506), and was the only 16th-century map that showed South America in its proper longitudinal position in relation to Africa. Geographers had spent several centuries unsuccessfully searching for a "lost map of Columbus" that was supposedly drawn while he was in the West Indies. After reading about the map's discovery in The Illustrated London News, United States Secretary of State Henry L. Stimson contacted the United States Ambassador to Turkey Charles H. Sherrill and requested that an investigation be launched to find the Columbus source map, which he believed may have been in Turkey. In turn, the Turkish government complied with Stimson's request, but they were unsuccessful in locating any of the source maps. The Piri Reis map is currently located in the Library of the Topkapı Palace in Istanbul, Turkey, but is not usually on display to the public. The map was depicted on the reverse of the Turkish 10 million lira banknote of 1999-2005 and of the new 10 lira banknote of 2005-2009. The map is a portolan chart, as shown by the four compass roses (two large and two small) from which lines of bearing radiate. Some analyses assert that the map is an azimuthal equidistant projection centered on Cairo, but a 1998 analysis by Steven Dutch of the University of Wisconsin Green Bay shows a better fit with a point near the intersection of the present-day prime meridian and the equator. There are extensive notes in Ottoman Turkish around the edges of the map, as well as some interior detail which is mostly inaccurate and fanciful. The Iberian peninsula and the coast of Africa are rendered accurately; as for the Americas, the northern portion of the South American coast is also fairly accurate and positioned correctly with respect to Africa. Much of the Caribbean is also mapped fairly accurately and appears to reflect Columbus's maps of the area. The area representing North America bears almost no resemblance to its real coastline (which is unsurprising, since by this time, it was still almost totally unexplored) except for one projection which might be Newfoundland; an island labelled "Antilia" may actually be Nova Scotia, since it has a note attached which refers to the legendary voyages of Saint Brendan. There is some suggestion that this area may represent the Asian coast. Island groups in the east Atlantic are accurately placed, but are depicted out of scale. The Piri Reis map is not the most accurate map of the sixteenth century, as has been claimed, there being many, many world maps produced in the remaining eighty-seven years of that century that far surpass it in accuracy. The Ribeiro maps of the 1520s and 1530s, the Ortelius map of 1570, and the Wright-Molyneux map of 1599 (‘the best map of the sixteenth century’) are only a few better-known examples. There are two major discrepancies from known coastlines: the North American coast mentioned above, and the southern portion of the South American coast. On the Piri Reis map, the latter is shown bending off sharply to the east starting around present-day Rio de Janeiro. A more popular interpretation of this territory has been to identify this section with the Queen Maud Land coast of Antarctica. This claim is generally traced to Arlington H. Mallery, a civil engineer and amateur archaeologist who was a supporter of pre-Columbian trans-oceanic contact hypotheses. Though his assertions were not well received by scholars, they were revived in Charles Hapgood's 1966 book Maps of the Ancient Sea Kings. This book proposed a theory of global exploration by a pre-classical undiscovered civilization based on his analysis of this and other ancient and late-medieval maps. More notoriously, these claims were repeated in Erich von Däniken's Chariots of the Gods (which attributed the knowledge of the coast to extraterrestrials) and Gavin Menzies's 1421: The Year China Discovered the World (which attributed it to supposed Chinese voyages), both of which were roundly denounced by both scholars and debunkers of fringe works, but which attracted huge popular followings. A more sober analysis of these claims was published by Gregory McIntosh, a historian of cartography, who examined the map in depth in his book The Piri Reis Map of 1513 (Athens and London: University of Georgia Press, 2000). He was able to find sources for much of the map in Columbus's writings. Certain peculiarities (such as the appearance of the Virgin Islands in two locations) he attributed to the use of multiple maps as sources; others (such as the errors in North American geography) he traced to the continued confusion of the area with East Asia. As far as the accuracy of depiction of the supposed Antarctic coast is concerned, there are two conspicuous errors. First, it is shown hundreds of kilometres north of its proper location; second, the Drake Passage is completely missing, with the Antarctic Peninsula presumably conflated with the Argentine coast. The identification of this area of the map with the frigid Antarctic coast is also difficult to reconcile with the notes on the map which describe the region as having a warm climate. It should be kept in mind that maps of the period generally depicted a large continent named Terra Australis Incognita of highly variable shape and extent. This land was posited by Ptolemy as a counterbalance to the extensive continental areas in the northern hemisphere; due to a lack of exploration and various misunderstandings, its existence was not fully abandoned until circumnavigation of the area during the second voyage of James Cook in the 1770s showed that if it existed, it was much smaller than imagined previously. The first confirmed landing on Antarctica was not until 1820, and the coastline of Queen Maud Land did not see significant exploration before Norwegian expeditions began in 1891. In 1513, Cape Horn had not yet been discovered, and indeed Ferdinand Magellan's voyage of circumnavigation was not to set sail for another six years. It is unclear whether the mapmaker saw South America itself as part of the unknown southern lands (as shown in the Atlas Miller), or whether (as Dutch thought) he drew what was then known of the coast with substantial distortion, but in any case, serious scholarship holds that there is no reason to believe that the map is the product of genuine knowledge of the Antarctic coast. Johannes Schöner globes, made in 1515 and 1520. Also shows a Southern Continent at the South Pole. ↑ Nebenzahl 1990, p. 63. ↑ Soucek, Svat (1995), "Piri Re'is", in Bosworth, C. E.; van Donzel, E.; Heinrichs, W. P.; et al., Encyclopaedia of Islam, vol. 8, Leiden: Brill Publishers, p. 308, ISBN 90-04-09834-8 . 1 2 Kahle 1933, p. 621. ↑ Mollat du Jourdin, La Roncière & le R. Dethan 1984, p. 218. ↑ Portinaro & Knirsch 1987, p. 47. ↑ Tekeli 1985, p. 676. ↑ Babinger, Franz (1936), "Piri Re'is", in Houtsma, M. Th., Encyclopaedia of Islam, vol. 3, Leiden: Brill Publishers, pp. 1070–1071 . ↑ Deissmann 1933, p. 111. ↑ Van de Waal 1969, p. 82. ↑ Smithsonian Institution 1966, p. 104. ↑ Stiebing 1984, pp. 1–2. 1 2 Hapgood 1966, p. 1. ↑ From the preface of Piri's Kitab-ı Bahriye (1521), as translated in Kahle 1933: "This poor man [Piri Reis] had previously constructed a map which, in comparison with maps hitherto known, displayed many more [and] different details, [and] in which he had included even the newly published maps of the Indian and Chinese Oceans which at that time were totally unknown in the country of Rūm [the Ottoman Empire]; and he had presented it in Cairo to the Turkish Sultan Selim I, who graciously accepted it." ↑ Hapgood 1966, p. 2. 1 2 Kahle 1933, p. 624. ↑ Inscription 6 on the map reads: "In this age, no one has seen a map like this. The hand of this poor man [Piri Reis] has drawn it and completed it from about twenty charts and mappaemundi. These are charts drawn in the days of Iskender dhu-l Karnian [Alexander the Great], which the inhabited quarter of the world. The Arabs name these charts Jaferya." Translation from McIntosh 2000, p. 15. ↑ In this case, the Seven Seas are the Chinese Sea, the Indian Sea, the Persian Gulf, the Caspian Sea, the Western Sea (Atlantic Ocean), the Red Sea and the East African Sea (sea surrounding the East African island of Zanzibar), as identified by Piri in Kitab-ı Bahriye (1521). Kahle 1933, p. 624. ↑ Translation from McIntosh 2000, pp. 15, 17. ↑ Afetinan & Yolaç 1954, pp. 24, 31. ↑ Kahle 1956, p. 106. ↑ Tekeli 1985, p. 677. ↑ Afetinan 1987, p. 27. ↑ Yerci 1989, p. 154. ↑ Atil, Esin (1987), The Age of Sultan Süleyman the Magnificent, New York: Harry N. Abrams, Inc., p. 81 . ↑ Flem-Ath, Rand; Wilson, Colin (2000), The Atlantis Blueprint, Little, Brown and Company, p. 18 . ↑ A. Gerber, Deissmann the Philologist, Berlin, 2010, 198-201. ↑ G. A. Deissmann, Forschungen und Funde im Serai, Berlin, 1933, 111-122. ↑ Hapgood 1966, p. 211. ↑ Hapgood 1966, pp. 1–2. ↑ Central Bank of the Republic of Turkey. Banknote Museum: 7. Emission Group - Ten Million Turkish Lira - I. Series. – Retrieved on 20 April 2009. ↑ Central Bank of the Republic of Turkey. Banknote Museum: 8. Emission Group - Ten New Turkish Lira - I. Series. 1 2 3 4 5 6 7 8 9 10 Dutch, Steven. "The Piri Reis Map". Retrieved 2013-08-16. ↑ McIntosh 2000, p. 59. ↑ U.S. Antarctic Program External Panel of the National Science Foundation. "Antarctica—Past and Present" (PDF). Retrieved 6 February 2006. ↑ Guy G. Guthridge. "Nathaniel Brown Palmer, 1799-1877". NASA, U.S. Government. Retrieved 6 February 2006. 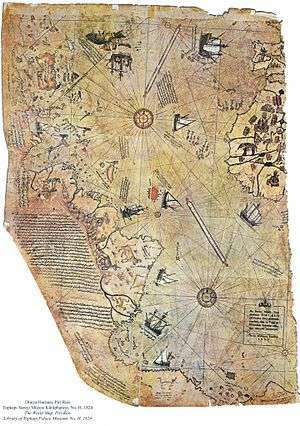 ↑ http://xoomer.virgilio.it/dicuoghi/Piri_Reis/PiriReis_eng.htm Diego Cuoghi, Thorough article on Piri Reis and Oronteus maps refuting the Antarctica claims. Afetinan, A.; Yolaç, Leman (trans.) (1954), The Oldest Map of America, Drawn by Piri Reis, Ankara: Türk Tarih Kurumu Basimevi, pp. 6–15 . Afetinan, A. (1987), Life and Works of Piri Reis: The Oldest Map of America (2nd ed. ), Ankara: Turkish Historical Society, OCLC 19674051 . Hapgood, Charles H. (1966), Maps of the Ancient Sea Kings: Evidence of Advanced Civilization in the Ice Age, New York: Chilton Books, ISBN 0-8019-5089-9 . Deissmann, Adolf (1933), Forschungen und Funde im Serai: Mit einem Verzeichnis der nichtislamischen Handscriften im Topkapu Serai in Istanbul, Berlin: Walter de Gruyter . Flem-Ath, Rand; Wilson, Colin (2000), The Atlantis Blueprint, Great Britain: Little, Brown and Company, p. 18, ISBN 0-316-85313-5 . Kahle, Paul E. (October 1933), "A Lost Map of Columbus", Geographic Review, American Geographical Society, 23 (4): 621–638, doi:10.2307/209247, JSTOR 209247 . Kahle, Paul E. (April 1956), "Piri Re'is: The Turkish Sailor and Cartographer", Journal of the Pakistan Historical Society, 4: 101–111 . McIntosh, Gregory C. (2000), The Piri Reis Map of 1513, Athens, Georgia: University of Georgia Press, ISBN 0-8203-2157-5 . Mollat du Jourdin, Michel; La Roncière, Monique; le R. Dethan, L. (trans.) (1984), Sea Charts of the Early Explorers, Thirteenth to Seventeenth Century, New York: Thames & Hudson, ISBN 0-500-01337-3 . Nebenzahl, Kenneth (1990), Atlas of Columbus and the Great Discoveries, Chicago: Rand McNally, ISBN 0-528-83407-X . Portinaro, Pierluigi; Knirsch, Franco (1987), The Cartography of North America, 1500–1800, New York: Facts on File, ISBN 0-8160-1586-4 . Smithsonian Institution (1966), Art Treasures of Turkey, Washington, D.C.: Smithsonian Institution, OCLC 1027066 . Stiebing, William H., Jr. (1984), Ancient Astronauts, Cosmic Collisions and Other Popular Theories about Man's Past, Amherst, New York: Prometheus Books, ISBN 0-87975-285-8 . Tekeli, Sevim (1985), "The Map of America by Piri Reis", Erdem, 1 (3): 673–683 . Van de Waal, E. H. (1969), "Manuscript Maps in the Topkapǐ Saray Library, Istanbul", Imago Mundi, 23 (1): 81–95, doi:10.1080/03085696908592335 . Yerci, M. (1989), "The Accuracy of the First World Map Drawn by Piri Reis", The Cartographic Journal, 26 (2): 154–155 . Turkey in Maps: The Piri Reis margin notes, translation from The Oldest Map of America (Afet Inan, Ankara, 1954). Sacred Text Archive: pseudo-scholarship about an Ice Age civilization, translation of the map commentary. "Piri Reis and the Columbian Theory" by Paul Lunde: ascii text from Aramco World Magazine (Jan-Feb 1980). Citat: "...There may, in fact, be an even simpler explanation of the presence of "Antarctica" on the Piri Reis map..."
Fingerprints of the Gods (2001) ascii text. Citat: "...William Miller wrote:...The examinations that I have made of it show all sorts of errors that certainly falsify any claim of unusual accuracy for this map..."
The Mysteries of the Piri Reis Map: by Diego Cuoghi. On the Piri Reis, Oronteus, and Philippe Buache maps; comparison to other 16th-century maps of America and Asia, debunking the Antarctica claims.